This Made in the USA root concealer hides mismatched growth until you can hit the salon. 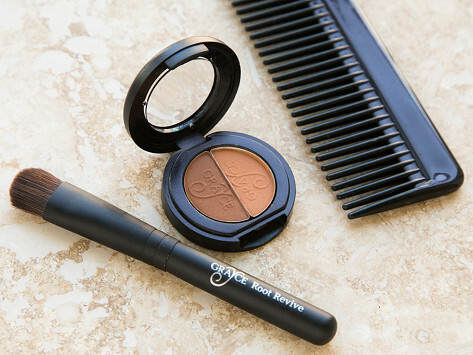 A duo color pot lets you blend the just-right shade, and the powder is easy to brush on. It’ll stay put until you shampoo it out. 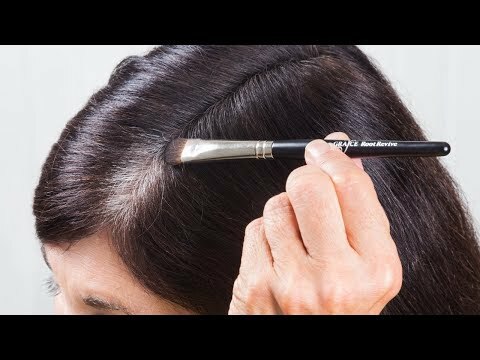 Designed to cover grow-out that is up to 0.75"
Dimensions: 3" x 5" x 0.5"
I use this daily to cover grey roots, but to also help make my part look thinner. I love this stuff. It works like a charm and is pretty easy to apply. Getting a good match takes a little longer, but looks really natural. The root revive works great...it colored my grays and didn't look unnatural. Like many women, Root Revive Maker Lynette Lange struggled to get good results with at-home root cover-up jobs. So she created a root concealer that’s as easy to apply as it is to wash out. The Made in the USA powder concealer is a two-shade color pot. Blend or layer the colors to get a just-right shade that gives full coverage. The container is portable and easy to apply, so you can touch-up anywhere you are. Even better, it won’t stain skin or linens, or flake off. The powder lasts for 48 hours of concealing coverage or until you shampoo it out.